Metal Wall Art > Contemporary > Tightly Wound Spirals Wall Panels. Metal Wall Art > $101 - $150 > Tightly Wound Spirals Wall Panels. Metal Wall Art > Panels & Plaques > Tightly Wound Spirals Wall Panels. Metal Wall Art > Rectangle > Tightly Wound Spirals Wall Panels. Metal Wall Art > Panels & Plaques > Two Panels > Tightly Wound Spirals Wall Panels. Metal Wall Art > Two Panels > Tightly Wound Spirals Wall Panels. 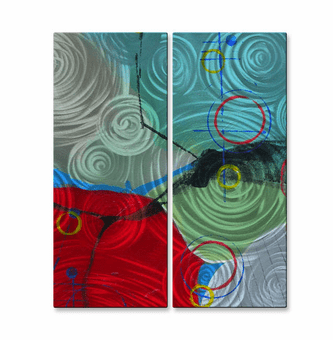 This set of modern abstract art wall panels are full of bold color and repeated pattern. Each features overlays of deep, saturated color such as scarlet red, teal and egg yolk yellow. The panels are covered in a series of spiral shapes, from solid colored circles to concentric circles that create tightly wound spiral forms.